Misch Metal is an alloy of active Rare-Earth elements containing about 50% Cerium, 25% Lanthanum, 7% Praseodymium, 3% Neodymium and 15% Iron. Machined into rods, this material makes a shower of sparks when scraped with a steel file - or just about anything. The alloy's ignition temperature is very low so just the heat generated by friction is enough to ignite the small particles that come off the rod producing the shower of sparks. Aside being really fun to sit around and make sparks with, they do have a variety of useful applications from starting campfires without matches to special effects in movies. 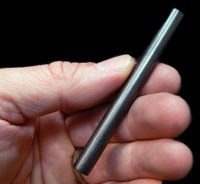 The rod is 85 mm long x 8 mm in diameter ( a little over 3-1/4" long x 5/16" in diameter).